Bookkeeping SiteSearch | What Are You Searching For? Welcome to Bookkeeping SiteSearch. What are you searching for? Are you wondering where exactly to find out about how to start your own business? Can't remember which pages feature the chart of accounts, accounts payable or bank and financial statements? There is no need to worry or waste precious time looking around! 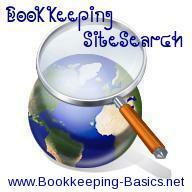 The Bookkeeping Basics SiteSearch helps to solve your accounting, income tax and/or search problem. If your question is with regards to bookkeeping, in the bookkeeping search box directly below, simply enter "Bookkeeping" followed by whatever you're searching for. Enter Your Bookkeeping Site Search Here! Do you have a question pertaining directly to accounting? In the accounting search box directly below, simply enter "Accounting" followed by whatever you're searching for. Enter Your Accounting Site Search Here! Do you have a question pertaining directly to income tax? In the income tax search box directly below, simply enter "Income tax" followed by whatever you're searching for. Enter Your Income Tax Site Search Here! Or, perhaps you would prefer to search the entire World Wide Web instead. You can do that from here as well. Enter Your World Wide Web Site Search Here! I hope that you have found this bookkeeping search site feature to be a helpful, time saving tool. As I continue to add additional topics and features to this bookkeeping services website, you may wish to set this page as a favorite on your toolbar for quick and easy access to search my site. Also, please be sure to share this useful bookkeeping search tool with your friends and family by liking or sharing this page by clicking on one the links below. Or, by commenting in the box below. Thank you!